Summer is here, and it's time for a baby swimsuit. 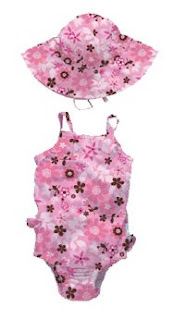 Last summer, we had her in this cute matching suit and hat set from iplay baby wear. Although I wasn't keen on the price ($20 for teh suit, $10 for the hat), I hadn't found any other reusable swim diapers that satisfied me. Reusable swim diapers fit right in with my cloth diapering attitude - why use anything else? And, honestly, I thought it was a pretty cute set. I've undergone a little bit of a transformation when it comes to children's clothing - I much prefer to buy good condition used clothing from yard sales and consignment shops. Generally, the consignment shops are more expensive than the garage sales, but consignment shops are more likely to have what you need in the size you need it, without spending many days driving around and not finding what you are looking for. And, if you're a brand name kind of person (which, apparently I am) you can find lots of brand name clothes at great prices. So, in my quest this year, I headed straight to a consignment shop. I didn't have time to poke about the yard sales, and I knew just what I was looking for. A pink pair of baby crocs (yes, I know about the hazard of letting children wear these toe biters. I'm in rural Missouri. We don't have escalators. We hardly have curbs.) - retail price $25.00 - my price - $5.00, and in like new condition. I was somewhat disappointed, however, that it wasn't an iPlay swimsuit. It's remarkably similar, but alas, not the same brand. There was something about the suit that caught my attention - there wasn't too much identifying information on the tags, and I became curious about who manufactured it. All I could find on the tag was an 800 number, so I Googled it. Lo, and Behold! Play Baby is manufactured by I Play. No wonder the suit looked so familiar! I called the number, and they tell me that there is no difference in quality - the Play Baby brand is made for mass market distributors, while the I Play brand is made for specialty shops. Different patterns are used in the different brand lines. So, in the end, I got the suit that I wanted, and saved $15 in the process. Way to save some dollars, and still dress my girl in cute clothes!